Another round of ABBA hits inspires this musical sequel, which benefits from new additions to the cast. Stuffing wall-to-wall ABBA songs into a flimsy rom-com story, 2008's Mamma Mia! always felt like it was mere seconds away from two things happening. "Have you met my friend Fernando?" Meryl Streep's overalls-clad hotel owner might say, before asking if he can hear the drums. Or Colin Firth, Pierce Brosnan and Stellan Skarsgård's trio of long-lost exes might compare their romantic plight to history, starting with the words "my my, at Waterloo Napoleon did surrender". Neither actually occurred in the original big-screen jukebox musical, which adapted the successful stage production of the same name. But if they had, and in such a groan-inducing, eye-roll-worthy fashion, they wouldn't have felt out of place. 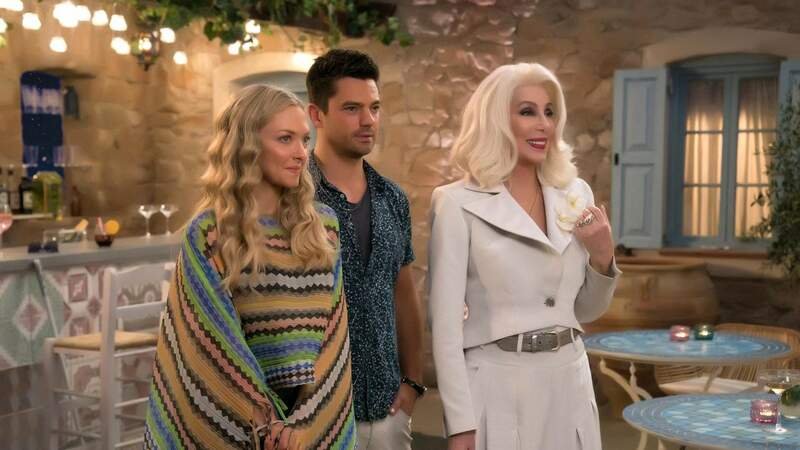 Shameless cheesiness and trying to shoehorn in as many of the Swedish pop group's tracks as possible was the name of the game the first time around — and it's a tune that sequel Mamma Mia! Here We Go Again is still blasting. Thankfully, there's slightly more nuance, plot and comedy in this repeat spin. Slightly. Crucially, as returning and new cast members alike croon and swoon against the movie's bright, breezy Greek island setting, there's also a boost in singing talent. First things first: 'Fernando' and 'Waterloo' do get a whirl in Mamma Mia! Here We Go Again, and in situations very close to those described above. The off-screen team is mostly new here, but it still feels like these films write themselves. In fact, while writer-director Ol Parker (Now Is Good) works with a story also credited to romantic-comedy maestro Richard Curtis (Love Actually) and Mamma Mia! playwright Catherine Johnson, he's basically rehashing the same tale. In the first movie, Sophie (Amanda Seyfried) sent wedding invitations to the three men (Firth, Brosnan and Skarsgård) that her mother Donna (Streep) had flings with when she was conceived. This time around, the movie jumps between Sophie's present-day preparations to relaunch her mum's hotel and Donna's (Lily James) amorous exploits with the guys in question (Hugh Skinner, Jeremy Irvine and Josh Dylan) 25 years ago. Here we go again, indeed. The line in 'Waterloo' about history repeating itself also springs to mind — and if you start framing your thoughts in ABBA lyrics minutes into this follow-up, then the film has done its job. Collecting fans' money, money, money, taking few chances, and asking viewers to cheer and sing along when their favourite songs pop up, the Mamma Mia! franchise does what lazy pop culture celebrations tend to do. In the most superficial, crowd-pleasing, fan-service manner, it mistakes recognising something exists for actually engaging with it. Ready Player One did the same thing earlier this year, just with a different focus — throwing sci-fi and gaming references at the screen to nod to beloved characters, movies and titles, but without ever delving any deeper. Still, in Mamma Mia! Here We Go Again much more than in its predecessor, the approach hits a few melodic notes. Or rather, the exuberant James does, alongside the other series newcomers that play younger versions of existing characters, and Cher as Sophie's grandmother. It helps that the story feels a little less like dead air between songs in this second outing, that the film has a pronounced rhythm rather than just smashing tracks together, and that the song-and-dance choreography is more polished. That said, having energetic talent who can hold a tune helps even more. Battling it out with Christine Baranski (playing one of Donna's life-long best friends) as the franchise's true star, you'll thank James for the music. 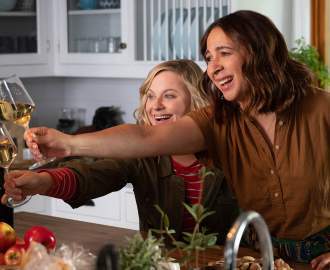 Courtesy of her performance, you'll also be able to somewhat overlook the fact that the flick is mostly just famous faces making ABBA music videos amidst gorgeous scenery.